The problem with making presents for Christmas is that you can't show them off until they been opened by the recipient. 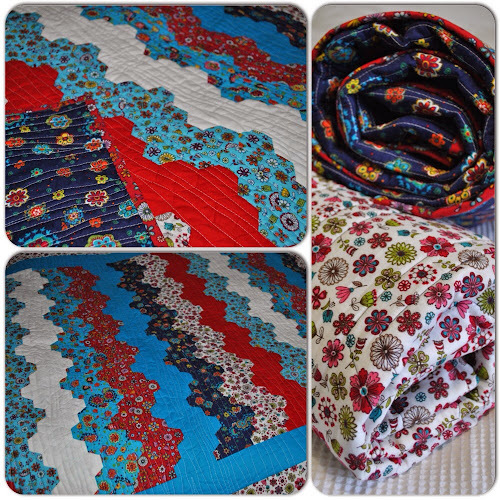 Now we've arrived in Germany to spend New Year with our good friends in Hamburg, I can reveal the three quilts that have been keeping me busy over the last month. I found these gorgeous floral prints buried in Doughty's dress fabric shop, and thought they'd be perfect for two little girls I know. The first quilt is a variation on my Chanteille design, made with strips sewn together then cut into triangles to make up half hexagons. These are sewn into rows, then sewn together to create full hexagons, avoiding any Y-seams. Bonus! I started the second quilt as an EPP project in the summer, I do love my hexagons! 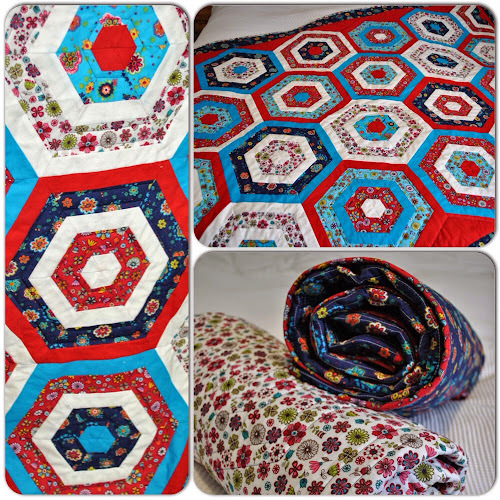 In the past I've only made flowers, but decided to sew the hexagons into four-piece units, and then into rows to create a wave-like effect across the quilt, added to by my current favourite machine quilting technique. 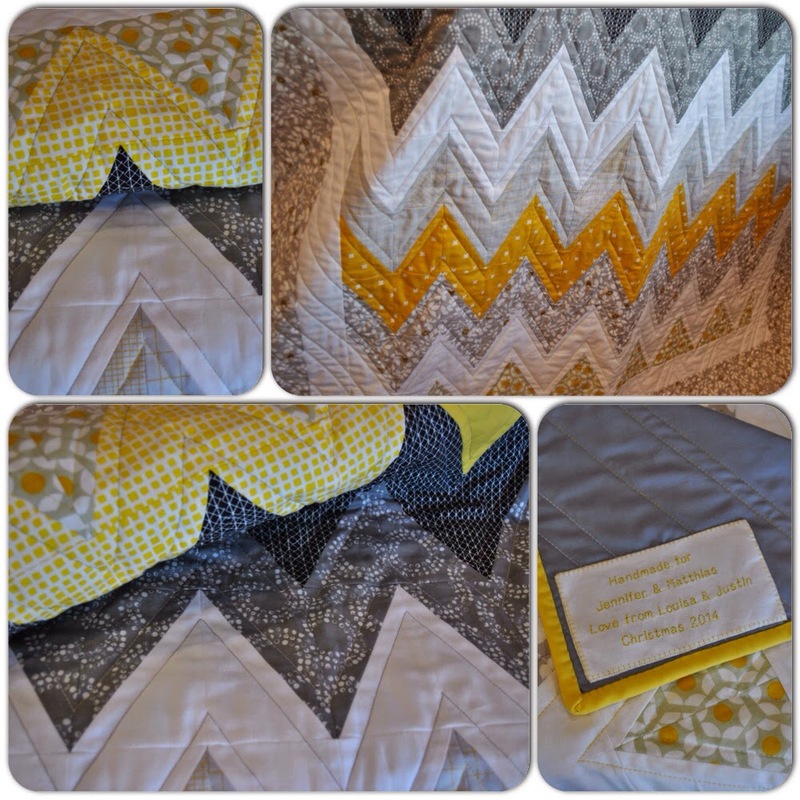 As I made quilts for the girls, I thought I really should make one for their parents... Of course I decided this about 2 weeks before Christmas, as you do! I've been looking at half-rectangle triangles for a while so thought I'd have a go and make this zigzag quilt. I love how this has turned out, and plan to make more in the new year, with the pattern to go with it. I've got a lot planned for 2015, including much more quilting of course, but also a collection of comprehensive patterns, both for the beginner and the more experienced, following on from my free online tutorials on sewmotion. At the end of this year, I started designing and making a new cushion collection, currently available on Folksy. 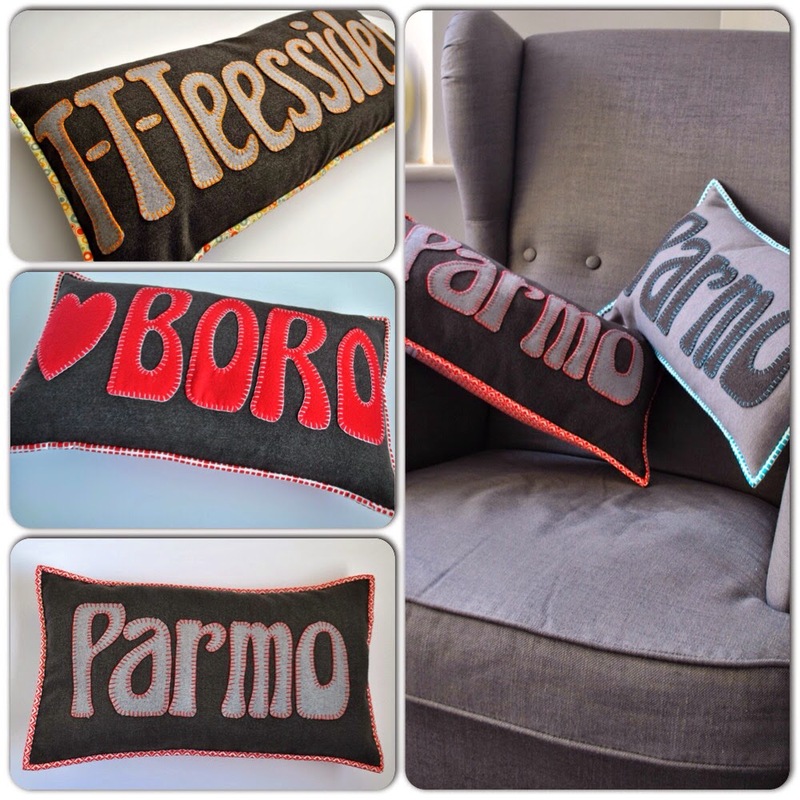 I hope to develop more designs, as well as a bespoke service to create personalised cushions to give as gifts. There will be more on this in the New Year, plus in February I'm off to Quilt Con in Austin, Texas. So I'm sure to come back with millions more ideas and plans!